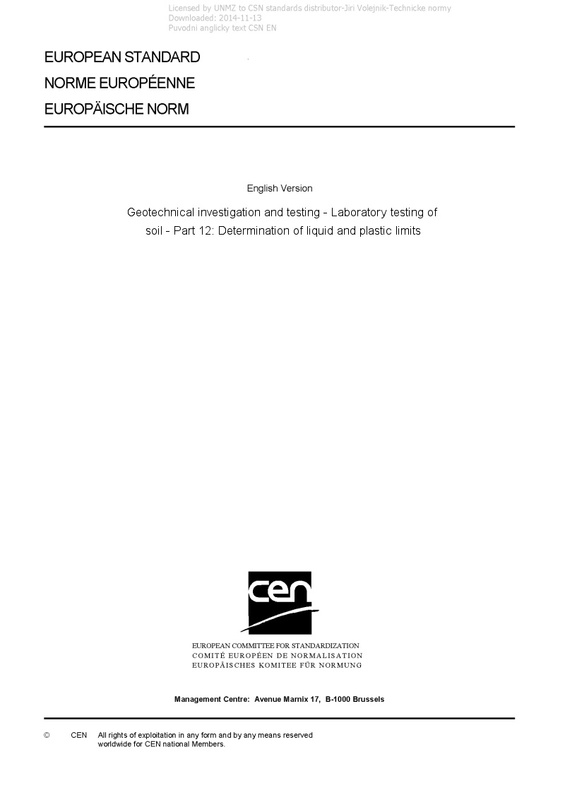 EN ISO 17892-12 Geotechnical investigation and testing - Laboratory testing of soil - Part 12: Determination of liquid and plastic limits - This document specifies methods for the determination of the liquid and plastic limits of a soil. These comprise two of the Atterberg limits for soils. The liquid limit is the water content at which a soil changes from the liquid to the plastic state. This document describes the determination of the liquid limit of a specimen of natural soil, or of a specimen of soil from which material larger than about 0,4 mm has been removed. This document describes two methods: the fall cone method and the Casagrande method. NOTE The fall cone method in this document should not be confused with that of ISO 17892-6. The plastic limit of a soil is the water content at which a soil ceases to be plastic when dried further. The determination of the plastic limit is normally made in conjunction with the determination of the liquid limit. It is recognized that the results of the test are subject to the judgement of the operator, and that some variability in results will occur.